Olubowale Victor Akintimehin Folarin (born September 21, 1984 in Washington, D.C.), better known by his stage name Wale, is an American rapper and producer. Fusing DC's homegrown go-go genre with a streetwise Northern hip-hop sensibility, he takes samples from all genres and blends them together with lyrical dexterity. In 2005 he released his debut mixtape, Paint a Picture, and has since released four more. His debut album, Attention Deficit, was released November 10, 2009. Wale was born to Nigerian immigrant parents in Washington, DC. He grew up on Peabody Street in Northwest DC and moved to Largo, Maryland as a teenager. He attended seven different high schools in Washington, D.C. and Maryland, finally graduating from Quince Orchard High School in 2001. He went to Robert Morris College and Virginia State University on football scholarships, and then Bowie State University but dropped out in 2004 to pursue music full-time. Before music started paying the bills, Wale worked day jobs at Sprint, Up Against The Wall and Downtown Locker Room. Wale emerged onto the local DC hip hop scene with the help of WKYS-FM's DJ Alizay. 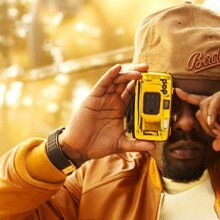 Wale began getting radio play in 2004 with a single called "Rhyme of the Century" which got Wale in the June 2005 "Unsigned Hype" section of Source magazine and his buzz started growing. In November 2006, a feature ran on AllHipHop.com's Breeding Ground about Wale. The day before Thanksgiving, Wale took the stage between Lil Wayne and T.i. during the Southern Invasion tour at the Verizon Center. In early December 2006, Wale won the award for "D.C. Metro Breakthrough Artist of the Year" at WKYS' Go-Go Awards. On December 15, The Fader magazine associate editor Nick "Catchdubs" Barat visited Wale for an interview and photo shoot which appeared in the March 2007 issue of The Fader. Wale has an upcoming promotional campaign with Remy Martin and XXL Magazine. He has also been linked to boutique streetwear brands The Hundreds, 10 Deep and Good Bully, as well as lifestyle brands Stussy and LRG. In January 2007, Wale released a new single to radio called "Good Girls." Daniel Weisman gave the song to Mark Ronson and on February 23, 2007, Ronson began playing the song on his East Village Radio show. A week later, at Ronson's studio, Wale recorded a freestyle for Ronson and in exchange, Ronson put Wale on an unreleased remix of Lily Allen's "Smile" which appeared on a number of music blogs around the world on March 13th, 2007. In April of 2007, Ronson asked Wale to join him on a UK tour to promote the release of his newest album. In June of 2007, Wale signed to a production deal with Ronson's Allido Records. On June 24, 2007, Wale's "Ice Cream Girl" with TCB, was featured on the show Entourage, on HBO. Wale performed "W.A.L.E.D.A.N.C.E. ", from his 100 Miles mixtape, at the 2007 MTV Video Music Awards in Las Vegas, NV. Wale was also featured in the October 2007 issues of XXL and Rolling Stone. The Washington Post profiled Wale on the front page of the Sunday Style section in the October 21st, 2007 edition. Wale is featured on the cover of URB Magazine's 150th issue along with French electro group, Justice. iTunes released "Nike Boots" as a free download on November 13th, 2007 as its "Single of the Week." On Christmas Day 2007, Wale debuted the "Nike Boots Remix" featuring Lil Wayne and Green Lantern on his myspace page. Wale and Lil Wayne played a Nike Boots event called DC Stand Up at Ibiza Nightclub in DC on January 15, 2008 which was sponsored by Nike and Footaction. In the November 30th, 2007 issue of Entertainment Weekly, Wale is featured as one of 8 people to watch in 2008 along with actors Simon Pegg and Rachel McAdams. On March 12, 2008, Wale announced on 93.9 WKYS that he had signed with Interscope. On April 29, 2008, the new Roots album entitled Rising Down was released, featuring Wale on the final track. Wale's relationship with the Roots began when Black Thought heard a song recorded as a tribute to himself on Wale's 2007 mixtape 100 Miles & Running and contacted Wale. In the June issue of the German Hip-Hop magazine JUICE Wale announced that his upcoming debut-album will feature production credits from Mark Ronson, Kanye West, Just Blaze, 9th Wonder and the French electronic music duo Justice. Darling fans if you are reading this, you clicked on the page of the recording artist wale in our eLyricsWorld. Our database has data about 52389 artists from all over the world as well as 829824 songs 454 of which are from wale. Besides the artist's biography, on this page you can see brief information about them, enlists birthdate, style, record label Be conversant with all the events around wale by adding RSS feed. If you prefer you could directly visit the page you are on right now and check out the latest songs about the artist.